The Royal Australian Mint has released a special coin collection distributing the coin set and coloured circulation coins through Woolworths supermarkets. 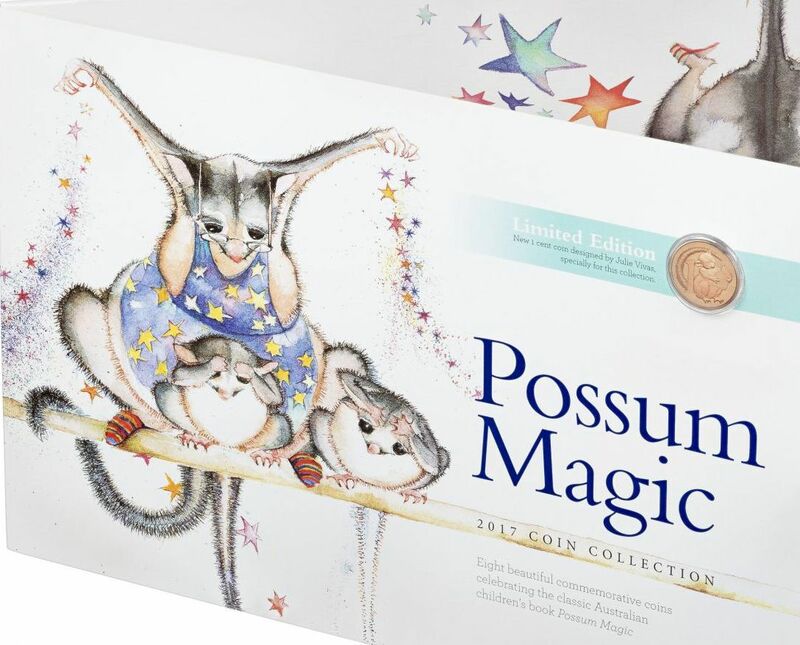 The collection celebrates Australia’s most popular childrens book “Possum Magic” that has sold over 3 million copies since it was written in 1983. Written by Mem Fox, this enchanting tale is illustrated by Julie Vivas and it is Julie’s whimsical illustrations that adorn the reverses of three coloured circulation $2 coins, four one dollar coins and a special limited edition one cent piece. 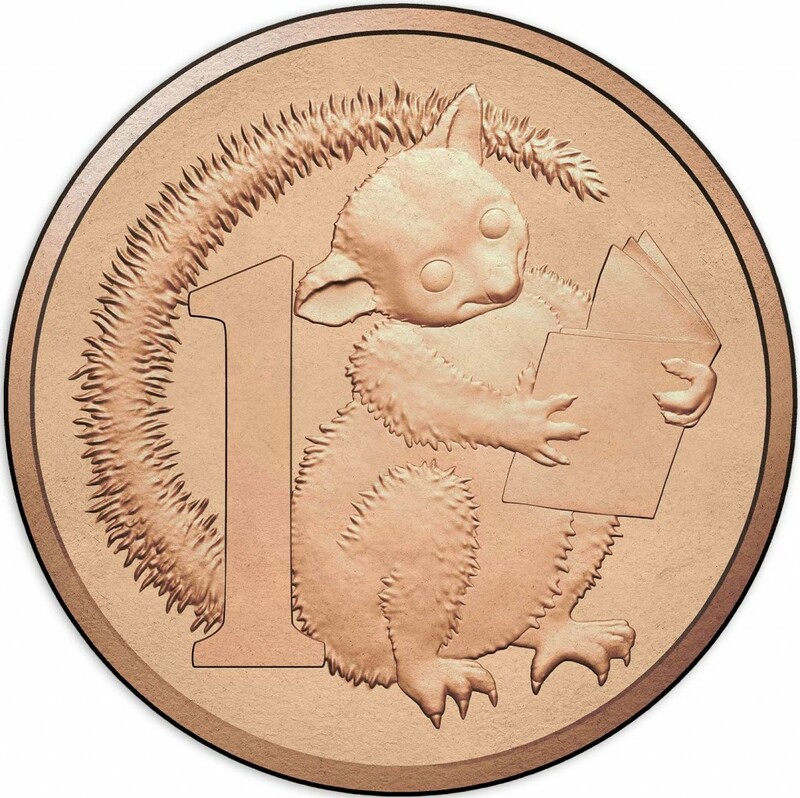 Each coin depicts Hush, an adorable possum in various stages of her magical journey across Australia eating special foods including Vegemite sandwiches and lamingtons. The $2 coins are proving popular being released into circulation via your change at the supermarket over a 3 week period. A sellout at most Woolworths now you can still purchase the coin sets from the Mint in Canberra or your local coin dealer. The sets in a foldout collector card feature the circulation coloured 2 dollar coins, four commemorative $1 coins and special 1 cent piece. Multi-coloured magic dust 2 dollar coins are included in this set and are also being sent into circulation. From left the first coin is predominantly blue and depicts Invisible Hush hanging from a tree. The middle coin predominantly purple shows Hush on her invisible journey, after eating a Vegemite sandwich she can see her tail again. Right is the predominantly orange coin with an elated happy Hush being visible again. The commemorative dollar coins all depict Hush and Grandma Poss as illustrated by Julie Vivas. From left the first coin depicts Grandma Poss magically turning Hush invisible, the second racing across Australia in search of food to make Hush visible again, the third eating lamingtons as they are magical and a cure for invisibility and then far right Hush and the magical food that will help her stay visible forever. The limited edition 1 cent is the first change to the one cent Australia has seen since it’s introduction in 1966 and then removal in 1992. Fittingly the design is still a possum but a change from the well-known Stuart Devlin design to the adorable Hush from the book Possum Magic illustration by Julie Vivas. The new 1c was designed especially for this set and is currently the only way to obtain the commemorative one cent. Issue price for the set is $15. For a set with a face value of $10.01 that’s very good value!